You know how some weeks you just get an amazing amount of stuff accomplished? Yeah, that hasn't been my week, last week or this week. But I've been trying to get started FINISHING a bunch of works in progress, starting with my noodlehead clutches. Wish me luck and a good nap for/from the doodlebug tomorrow and something might actually get done! Shot cotton LOVE - thank you Kaffe! Seriously, I just drool over all these rich, gorgeous colors. I just love looking at them stacked in the late afternoon sun, aaaahhhh, happiness. Of course, not everyone feels the same way. Teehee...sorry baby! Yup, it's sideways, but you get the idea :-) This is the gathered clutch pattern from Anna over at Noodlehead and I LOVE it! I had some really pretty scraps left over from a scarf and decided to try one of these and I seriously love it. Next time I would change the orientation of either the zipper or the handle - right now if you were carrying this on your wrist and it was zipped, the zipper would be closed at the bottom, which makes me worry that things might fall out, so that's one tiny change but otherwise this is a great pattern, very easy to follow. I also made the strap a little differently - I hate turning something that long and skinny, but again, personal preference. Lined in the same pretty green at the strap AND I even made the card- holders for the inside - fancy-schmancy, right? Anyway, I bought the longer pattern which I think was really worth it and I got the hardward for the strap and handle here (sets with 3/4 inch D ring). I can see making a bunch of these to use for gifts - who wouldn't like getting a cutie like this? Well, not exactly like this, because this one is all mine! 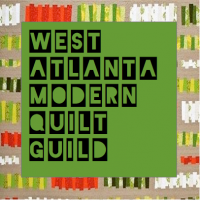 Modern Sewing Guild meeting at Whipstitch in Atlanta tomorrow, 9AM to noon - we'd sew love to see you there (oh yes I did)! Just a bunch of girls who like to talk to other girls about sewing and fabric and stuff - how can you beat that? Have a great weekend! These are made with the same tutorial as in my first post (find it at Toni Coward's Make it Perfect blog). I used some fat quarters I already had for the front with patchwork and some rikrak for contrast and fun. I think they're better but still not SQUARE in those corners up by the zipper end. I don't want to see like a perfectionist but it is making me INSANE. Nice close up of the interior - I love how the red really pops on this one! I think I might need to make the seam along the zipper edge a little farther away from the zipper, so that the edges have a little more room to lay down on the ends. 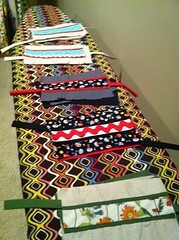 I'm just guessing here, trying to figure out what to try on the next batch of pouches to get those NICE SQUARE CORNERS. Aaargh. Remember those stripes-into-squares blocks I made? A couple of the attempts turned into these pouches - cute, no? Just don't look at the corners. And the lining colors - yes, all from my extensive stash. The only thing I had to buy was zippers and I HIGHLY recommend buying them here instead of from a store, if you have the time. The difference in price is a little shocking. Now, I could go sweep or scrub something but I think I might just sew...see you later! I recently became obsessed with the In a Spin quilt that Rita over at Red Pepper Quilts made, obsessed with making some of those blocks! So here is the WRONG way to do it - with the stripes of your fabric going perpendicular to the base of your triangle. Nice squares, interesting, but not AT ALL what I wanted. Back to the cutting board. This time I tried the stripes PARALLEL to the base of the triangle and VOILA!